Are you feeling burned out from your work as a professional caregiver? As internationally recognized trauma treatment leader Eric Gentry, Ph.D., LMHC, explains: There is no way to do professional caregiving without it having some negative impacts on our lives. I have watched many excellent caregivers in this field say enough; and leave the field because of compassion fatigue burn out. When a caregiver experiences compassion fatigue, what follows are feelings of hopelessness, stress and a sense of inadequacy. That's why Dr. Gentry designed this powerful Compassion Fatigue Professional Certification (CCFP) Training. Based on 15 years of break-through research with compassion fatigue, this training will help you recapture your sense of mission, purpose, hope and joy as a caregiver. Through this training, you'll learn the evidence-based professional resiliency skills to eliminate stress and combat the emotional demands of your work. Plus you'll meet the educational requirements for International Association of Trauma Professionals (IATP) Compassion Fatigue Professional Certification so you can teach your patients how to live more hopeful and joyful lives. Join Dr. Gentry and start feeling reinvigorated in your work to end your patients' suffering. This training meets the educational requirements for CCFP certification. This is an intermediate-level certification and course that is open to any care-giving professional or volunteer. By becoming a certified compassion fatigue professional you will be able to recapture your sense of mission, purpose, hope and joy in your office. Multi-disc DVD recording (5 hours, 28 minutes), with electronic manual and instructions. The three-DVD course is presented stepwise through the 16-certification criteria using didactic and experiential methods. Watch DVD "Tools for Hope"
Identify the process (i.e., “infection”) of secondary traumatic stress-how does a professional become gradually symptomatic when working with traumatized and suffering others? Eric Gentry, Ph.D., LMHC, is an internationally recognized leader in the field of disaster and clinical traumatology, having trained thousands of professionals and paraprofessionals worldwide in the treatment of traumatic stress. His doctorate is from Florida State University where he studied with Professor Charles Figley, one of the pioneers of traumatic stress. Dr. Gentry was one of the original faculty members of the Traumatology Institute and later became the co-director of the International Traumatology Institute at the University of Southern Florida. Dr. Gentry, along with Dr. Anna Baranowsky, is the co-author and co-owner of the Traumatology Institute Training Curriculum – 17 courses in field and clinical traumatology leading to seven separate certifications. Dr. Gentry has been a clinical member of several CISM teams and has provided assistance in many different disaster and critical incidents including Oklahoma City, New York City, and hurricanes in Florida. He was the developer of the Community Crisis Support Team, which began in Tampa, Florida, and has become a model for communities to integrate mental health services into their disaster response network. Dr. Gentry is the co-author of the critically acclaimed Trauma Practice: Tools for Stabilization and Recovery (Third Edition) (Hogrefe Publishing, 2014). His other books include Forward Facing Trauma Therapy (Compassion Unlimited, 2016) and co-authored Trauma, PTSD, Grief & Loss: The 10 Core Competencies for Evidence-Based Treatment (PESI, 2017). Additionally, Dr. Gentry has published many research articles, book chapters, and periodicals in this maturing area of study. He has a private clinical and consulting practice and is adjunct faculty at many universities. Dr. Gentry draws equally from his scientific study and from his rich history of 30+ years of clinical experience with trauma survivors to balance this training with current, empirically grounded information and experienced-based compassionate intervention skills. You will be challenged, inspired, and uplifted by Dr. Gentry and this unique training. Speaker Disclosures: Financial: J. Eric Gentry receives compensation as Owner of Compassion Unlimited. He receives royalties as an author for Hogrefo & Huber Publishing. Dr. Gentry receives a speaking honorarium from PESI, Inc. Non-financial: J. Eric Gentry has no relevant non-financial relationship to disclose. Martha Teater, MA, LMFT, LCAS, LPC, is a Diplomate with the Academy for Cognitive Therapy and is a practicing cognitive-behavioral therapist. She has maintained a private practice for over 25 years. She has worked in primary care settings, free clinics, and medication-assisted treatment programs. Martha is a Red Cross disaster mental health manager and has been on many national disaster deployments where she provides support to traumatized people. She is also involved with the Red Cross Service to the Armed Forces to develop programs to support military and veteran families. She has provided trainings in the United States and internationally on topics such as evidence-based treatments for trauma, DSM-5®, compassion fatigue, and behavioral treatment of chronic pain. A prolific writer, Martha has published over 175 articles in newspapers and magazines, including Psychotherapy Networker and Family Therapy Magazine. Martha is the co-author (with John Ludgate) of Overcoming Compassion Fatigue: A Practical Resilience Workbook (PESI, 2014) and (with Donald Teater) Treating Chronic Pain: Pill-Free Approaches to Move People From Hurt To Hope (PESI, 2017). Financial: Martha Teater maintains a private practice. She receives a speaking honorarium from PESI, Inc. Non-financial: Martha Teater is a Clinical Member of the American Association for Marriage and Family Therapy. John is a native of southern Ireland and obtained a Master Degree in Clinical Psychology from the University of Edinburgh in Scotland, and a Ph.D. from Trinity College, Dublin, Ireland in 1990. He trained at the Center for Cognitive Therapy in Philadelphia under Dr. Aaron Beck, the founder of Cognitive Therapy, obtaining a Post-Doctoral Fellowship in Cognitive Therapy from the University of Pennsylvania in 1986. He subsequently became assistant director of training at Dr. Beck’s Center. In the early 1990’s, Dr. Ludgate was a research clinical psychologist at the University of Oxford in England and served as cognitive therapist in several outcome studies of panic disorder, agoraphobia, social phobia and hypochondriasis. He authored Cognitive Behavioral Therapy and Relapse Prevention for Depression and Anxiety (Professional Resources Press, 2009) and was co-editor with Wright, Thase and Beck of Cognitive Therapy with Inpatients: Developing a Cognitive Milieu (Guilford Press, 1993). His other books include Overcoming Compassion Fatigue (PESI, 2014 co-authored with Martha Teater and The CBT Couples Toolbox (PESI, 2018). He has written numerous journal articles and book chapters in the field of Cognitive Behavior Therapy for Anxiety and Depression. He has presented many seminars and workshops on cognitive behavioral approaches, both nationally and internationally. This self-study activity consists of 6.0 clock hours of continuing education instruction. Credit requirements and approvals vary per state board regulations. Please save the course outline, the certificate of completion you receive from the activity and contact your state board or organization to determine specific filing requirements. Connecticut Addiction Counselors: Provider #120924. This course has been approved as a CCB approved training and has been awarded 6.0 hours by the Connecticut Certification Board. This intermediate self-study activity consists of 6.0 clock hours of continuing education instruction. Credit requirements and approvals vary per state board regulations. Please save the course outline, the certificate of completion you receive from the activity and contact your state board or organization to determine specific filing requirements. New York Counselors: PESI, Inc. is recognized by the New York State Education Department's (NYSED) State Board for Mental Health Practitioners as an approved provider of continuing education for Licensed Mental Health Counselors. #MHC-0033. This self-study activity will qualify for 7.0 contact hours. Full attendance is required; no partial credits will be offered for partial attendance. This self-study activity consists of 6.0 clock hours of continuing education instruction. Credit requirements and approvals vary per state board regulations. Please save the course outline, the certificate of completion you receive from this self-study activity and contact your state board or organization to determine specific filing requirements. New York Marriage & Family Therapists: PESI, Inc. is recognized by the New York State Education Department's (NYSED) State Board for Mental Health Practitioners as an approved provider of continuing education for Licensed Marriage and Family Therapists. #MFT-0024. This self-study activity will qualify for 7.0 contact hours. Full attendance is required; no partial credits will be offered for partial attendance. Iowa Nurses: PESI, Inc. is an approved provider by the Iowa Board of Nursing. Provider #: 346. Nurses successfully completing these self-study materials will earn 7.2 self-study contact hours. PESI, Inc. designates this self-study activity for a maximum of 6.0 AMA PRA Category 1 Credit(s)™. This activity was originally recorded on 01/01/2013. It was last reviewed on 01/30/2019 and is valid until 01/30/2022. Florida Board of Psychology: PESI, Inc., is an approved provider with the Florida Board of Psychology. Provider Number 50-399. This product qualifies for 6.0 self-study continuing education credits. Please make sure to bring your license number to the seminar so that we can report your attendance to CE Brokers. Minnesota Psychologists: This self-study activity has been approved by the Minnesota Board of Psychology for 6.0 continuing education hours. Colorado Social Workers: PESI, Inc. is an approved provider with the Colorado Chapter of the National Association of Social Workers. Provider #1413. This course has been approved for 6.0 continuing education hours. Florida Social Workers/Marriage & Family Therapists/Mental Health Counselors: PESI, Inc. is an approved provider with the Florida Board of Clinical Social Work, Marriage and Family Therapy and Mental Health Counseling. Provider Number 50-399. This self-study course qualifies for 6.0 continuing education credits. New York Social Workers: PESI, Inc. is recognized by the New York State Education Department's (NYSED) State Board for Social Work as an approved provider of continuing education for licensed social workers #SW-0008. This self-study activity will qualify for 7.0 contact hours. Full attendance is required; no partial credits will be offered for partial attendance. Expires: December 31, 2020. Ohio Social Workers/Counselors/Marriage & Family Therapists: PESI, Inc. is an approved provider with the State of Ohio Counselor, Social Worker and Marriage & Family Therapist Board. Provider approval #: RCST071001. Successful completion of this self-study course meets the qualifications for 6.0 clock hours of continuing education credit. 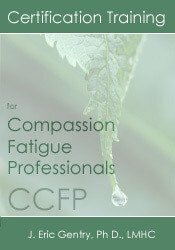 "Martha and John have put together a practical, practitioner-friendly workbook that addresses compassion fatigue with understanding and caring. They offer evidence based clinical tools reflecting behavioral, cognitive as well as mindfulness exercises in addition to assessment strategies that can be used to facilitate resilience. I highly recommend this resource to ensure professional competency." "This is an excellent book that addresses an important and timely topic for anyone working in the helping profession. It is well written and engaging and provides assessment measures and helpful exercises that are invaluable to the reader. I highly recommend to anyone who is a care provider." "Overcoming Compassion Fatigue offers invaluable resources that will benefit all practitioners - rookies and veterans alike. This well-researched workbook is filled with practical self-assessment tools and concrete strategies for detection, intervention and prevention. Integrating CBT techniques provides a unique and very hands-on approach to managing compassion fatigue and related of caregiver."